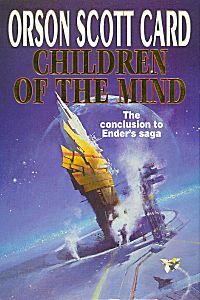 Description: Children of the Mind is preceded by Xenocide. There is a planned sequel that will tie together the Speaker and Shadow series called Shadows Alive. “Lusitania is home to three sentient species: The Pequeninos, a strange race native to Lusitania; a large colony of humans; and the Hive Queen, brought there by Ender. But the Starways Congress fears Lusitania and a strange virus that it harbors, and they have gathered a fleet to destroy the planet. Ender’s oldest friend, Jane, the computer intelligence that has evolved with him over three thousand years, allowed the Starways Congress to discover her existence when she tried to stop the fleet. Now they are trying to kill her as well, by shutting down the network of computers and ansibles in which she lives. They are afraid of her and of her control over all human communications.